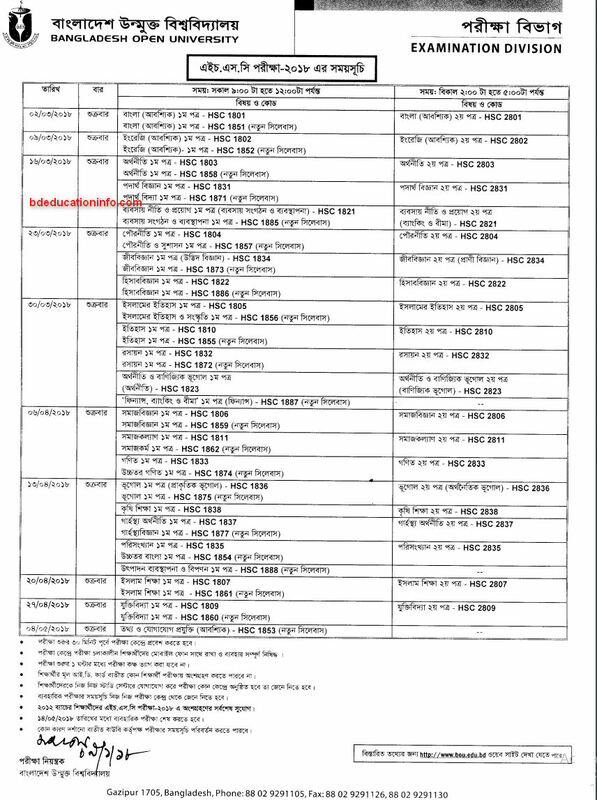 Bangladesh Open University (BOU) Published HSC schedule in 2018. Download HSC Schedule of BOU from there official website at http://www.bou.edu.bd. BOU HSC Routine 2018 Noticed that in this Year Exam will be held on 02 March 2018 at 09:00 to 12:00 PM .Bangladesh Open University Higher Education Examination Routine has been found on my website at bdeducationinfo.com . Let`s Download your Bou HSC Routine 2018 below this Post. HSC Routine of Bangladesh Open University with Full JPEG format are available on my website. You can also get more routine changing updates, Exam Result from http://www.bou.edu.bd . Practical Exam will be complete before 14 May 2018 and All Student of 2012 can attend this Examination. Hope You Download your HSC Routine 2018 of BOU from my website. For more updates about BOU HSC Exam Result , Routine etc. Connect with Us by Facebook Fan Page. This entry was posted in Exam Routine and tagged routine by admin. Bookmark the permalink.